Every year, my neighbor, Doris Love, lets me pick the apples from her tree that grow into my garden, and every year I make her an apple pie for Thanksgiving. 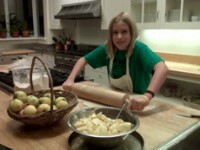 Here, is my recipe being demonstrated by Sophie Reitz-Bouren. 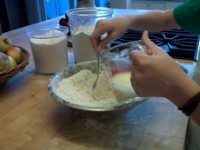 To make the pastry dough, put the flour, salt, and sugar in a medium-size bowl. Cut in the cold butter. When the mixture looks like coarse breadcrumbs or oatmeal flakes, stir in the water mixed with the egg yolk. Bring the mixture together with the fingers of one hand. Knead lightly to get the mixture to come together. Cover in wax paper and chill for 20 minutes. To make the filling, mix together the sugar, salt, cinnamon, and flour in a large bowl. Peel, core, and thickly slice the apples and toss them in the sugar mixture, coating them well. To line the plate, remove the dough from the refrigerator, roll two thirds of it out on a lightly floured surface to about 12 inches around. Line a 9-inch pie plate with the dough letting it overlap the edges by about half an inch. 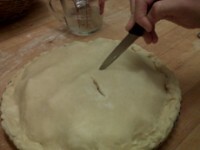 Roll out the remaining one-third of the dough to a round the size of the pie plate. Chill if either dough gets too soft. 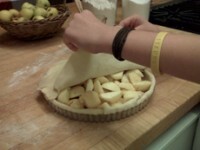 To assemble the pie, pile the apples in the lined plate, mounding them in the middle. Cover with the round. Fold over the edges and seal with a knife or fork. 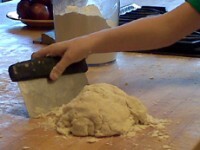 Brush the edges of the dough with water. Make three or four slits in the top of the dough to let the steam escape and bake in the middle of a preheated 375 degree oven for 35 to 45 minutes, or until the crust is lightly golden. 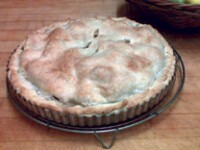 It is best to make this pie several hours ahead so that the apples re-absorb their liquid. Serve with whipped heavy cream or ice cream if desired.